Browse: Home / Waco: The Untold Story. The following was extracted from a report prepared by Attorney Paul Wilcher, a report based on actual eyewitness testimony. The members of the very assault team mentioned in the following report had been in contact with Paul Wilcher, via a third party, and given immunity from prosecution they had been prepared to testify. Even though these were hardened professional killers, what they had been ordered to do and actually done at Waco had deeply disturbed them. On May 21st, 1993, Wilcher went to present the following to US Attorney General Janet Reno, on June 23rd Wilcher’s badly decomposed body was found in his apartment. Upon discovery his apartment was sealed and searched and all documents removed. That indeed might have been the end of the matter but Wilcher had given a copy of his 100-page report to Sara McClendon, a senior White House correspondent, shortly before his death. Wilcher had made one critical mistake in presuming the innocence of Janet Reno and Bill Clinton; it was a mistake that was to cost him his life. 1) As early as Sunday afternoon or evening, April 18th (shortly after your conference with President Clinton), calls went in to the Parkland Hospital in Dallas–the very same hospital where President Kennedy was taken after his assassination in Dealey Plaza on November 22nd 1963 — again, at the hands of CIA professional killers — to be prepared to receive a large number of serious burn victims from Waco the following day. 2) On the morning of April 19th, the same Delta Force commando team — actually, a select group of the CIA’s top professional killers — which would have carried what I have referred to above the “penultimate plan,” had it been approved — was on the ground in Waco to carry out all aspects of the “wet” operation planned for that Monday. 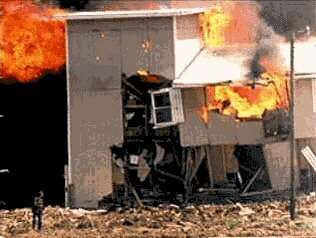 3) This mass murder was then to be covered up and made to look like a “mass suicide” — just like Jonestown — thereby layering one monstrous CIA lie upon another — since both Waco and Jonestown were CIA mass murders, and not mass suicides. 4) This Delta Force was composed of 15 men in all, headed by a Lieutenant Colonel who was a CIA liaison officer. The group flew into Texas on their own C-130 transport plane, parked it at the Waco or Dallas airport all day, then departed once their “dirty work” had been completed. The plane belongs to Triangle. 5) Among the 15 men in this larger group, there were two (2) smaller operational teams — the 4-man team which actually made the insertion into the compound, as described in detail below, and a back up team, which apparently was never used. 6) These were all dressed in black — black pants, black shoes, black jackets, black gas masks, black gloves — very poetic for a black or wet operation — and were dressed to look like all the other FBI officers on the ground — probably even wearing jackets with FBI insignias on them (though I am not certain of this), so that to any outside observer, there would have been virtually no way of telling these four men apart from any of the other federal officers on the scene at the time. 7) The whole nation watched on TV that morning as the FBI used M1-A1 tanks to punch holes in the exterior walls of the compound’s living quarters. We were later told that at the same time they had battered down these walls, the tanks had also lobbed massive quantities of a very virulent form tear gas into the compound. 8)This tear gas had been designed to be used for crowd control — i.e. it was so virulent and irritating that even in a fresh air out of doors situation, it was guaranteed to cause people to flee from its presence simply in order to be able to breathe. 9) Now, it was being used in a closed, indoor, living quarter’s situation where 95 men, women and children were trapped inside. The logical expectation would have been that all 95 of these persons would have fled out-of-doors instantly, just to be able to breath. But strangely, not a single person came out of the compound — even after this noisome substance had been poured into the compound in enormous quantities over a period of several hours. 11) The real truth, however, is much more sinister and cold-blooded. For what actually happened here is that the tear gas — as virulent and noisome as it was — was only the mask or cover for the real active ingredient being propelled by the tanks into the compound. What was actually propelled into the compound was a nerve reagent — a neuro toxin — NERVE GAS a virulent poisonous substance like curare — which instantly paralyzed and rendered totally helpless and defenseless all of the 95 men, women and children inside the compound — except for those 9, later rescued, like David Thibideaux, who were on the 2nd and 3rd floor with their windows wide open on both sides, and who were thus spared the deadly effects of this tear gas/nerve gas combination. For all the others, they could no longer coordinate their muscles in the effort required even just to get up, much less flee to the life sustaining fresh air outside, only a few feet away. This is an extremely serious matter, Attorney General Reno. For it means that here the U.S. military, the FBI, and the Justice Department — directed by the CIA — used nerve gas on innocent men, women and children in our civilian population — and then proceeded to murder them in cold blood, as is set out in detail below. This clearly rises to the level of War Crimes on a civilian population during peace time, an unspeakable human rights violation. And it was committed by our intelligence community against innocent men, women and children — simply to bury the truth concerning the CIA’s criminal use of mind control programming to “manufacture” “Manchurian Candidate type” robot assassins whose very existence is an unspeakable outrage, in and of itself. 12) After this deadly tear gas/nerve gas combination had had time to do its debilitating and paralyzing work on all the men, women and children in the compound, 4-man “Delta Force” team — actually some of the CIA’s top professional assassins — made its entry into the compound. Fittingly for a black operation, they were dressed all in black, from head to toe, as stated above. 13) They were dropped onto the roof of the compound by one of the several low-flying, heavily armed military helicopters which hovered overhead throughout much of the day — while all of the television cameras were focused on the outside of the building at ground level — for example, focusing on the tanks which had just lobbed the tear gas/nerve gas combination into the building. The actual insertion into the building came at approximately 10:25AM. 14) Before they entered the compound, however, this four man team of assassins had received shots of atropine, the antidote to the nerve gas, so that they, too, would not be overcome and paralyzed by it. 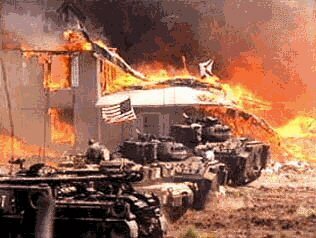 15) According to the testimony given before the House Judiciary Committee on the day of your testimony, Attorney General Reno, the fires in the Branch Davidian compound did not become visible until approximately 11:45AM that morning. This means that the team had something in the neighborhood of one (1) hour and fifteen (15) minutes, or so, in which to do their “dirty work”, and then to make their escape. One of the first things they did, obviously, was to go into the so-called communications center, just off the kitchen, where they found, and quickly subdued and killed, David Koresh, along with any of his close associates who were nearby. David Koresh was killed with a single bullet to the middle of the forehead, about an inch above the eyes, fired from a distance of about four inches away. 17) From the communications center, the “wet” team then fanned out throughout the rest of the compound, and methodically “took out”(i.e. murdered) all of the other six (6) CIA “sleepers” they would have murdered earlier, in what I have called the “penultimate plan”, had that plan been allowed to go forward, plus a number of other persons along the way…. 18) The remaining task for this “wet” team — after the multiple murders, described above, had been carried out — while they were still inside, was to place 3 or 4 canisters of “Willie Peter” (White Phosphorus) in strategic locations throughout the compound in order to start the fires. These canisters were all equipped with delayed timing devices, all set to go off simultaneously — apparently at or before 11:45AM, that’s when the fires were actually sighted by outside observers on the scene. CIA “wet” teams have also been known to corner their intended targets into a closed quarter, and then throw “Willie Peter” into their midst, so that these victims are instantly immolated right before the teams eyes. The fire which “Willie Peter” produces is so intense, and the combustion so complete, that victims — as was the case here in Waco — can only be identified by their dental records. But here, because the team itself was inside the closed quarters, they had to use delayed timing devices on the “Willie Peter” canisters — to give themselves time to make their own exit before the entire compound was consumed in the monumental conflagration we all watched in horror on television. 19) Notice that this explanation of how the fires started comports with the observations on the scene — with what the television cameras at ground level recorded, and with what the military helicopters and their infrared cameras overhead observed — i.e., that 3 or 4 fires started simultaneously at different places in the compound. And then these separate fires spread rapidly (because of the wood construction, the straw which was everywhere, the high winds, and the white hot “Willie Peter” incendiary devices which had started these separate blazes in the first place), until they became united into a cohesive whole, involving the entire compound, which became far more destructive than the sum of these separate smaller fires, until it ultimately became a massive conflagration which consumed everything in sight. One possible contrary explanation, which has been offered by commentators and the “tragic accident theory” advocates, is that the tear gas sprayed into the compound by the tanks…(ignoring the fact that what was injected was NOT just tear gas but a tear gas/nerve gas combination) was itself a combustible substance, that one of the tanks, in punching holes in the exterior walls, had accidentally knocked over a kerosene lantern or container, and that the kerosene had then ignited the tear gas, which resulted in the conflagration. This “tragic accident” theory, however, simply does NOT square with the known facts, preserved on videotape, because the compound did NOT explode into a massive fireball all at once (as would have been the case if the tear gas itself had been combustible, and had ignited by a torch, like lighted kerosene). 20) The other point to be made here is that, while the “wet” team did kill many of those inside the compound prior to setting the fires (by means of the “Willie Peter” canisters on delayed timing devices, discussed above) they apparently did NOT murder (at least, directly) ALL of the 86 men, women and children who ultimately died in the tragedy — meaning that many of those who died were left paralyzed by the nerve gas, unable to get up or free themselves from this disaster in progress, and were thus consigned to being consumed alive in the giant conflagration brought on by the white phosphorus. And those consigned to this horrible fiery fate — being burned alive — apparently included men, women and children. 21) The bottom line here is that 86 men, women and children died — i.e. they were murdered — in the Branch Davidian compound on Monday, April 19th, 1993 — ALL at the hands of the 4 members of this CIA “wet” team, operating under cover of the “Delta Force”. 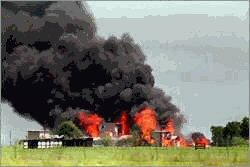 …including senior Reagan and Bush Administration holdovers in the Justice Department, the FBI, the BATF, the Pentagon and the CIA — all knew in advance of this Waco operation was designed from the start to be a mass murder in which only those few individuals whom the CIA had targeted in advance to be saved would be allowed to survive — and that ALL of the other 86 men, women and children in the compound would be murdered in cold blood by these CIA Delta Force assassins.